The Maine Man wrote: So refreshing to watch the Soton game on a good English language Joan. The commentator couldn't stop going on about big Dave and how he is.the best the PL has ever seen. Who needs Sky, etc? I do believe he is a city fan !! Yep. Left a voicemail for Seaman when he signed for us singing Blue Moon. You're dead wrong, loved but now hates City. His dad was a keeper for us and later a wealthy sausage dealer in Styal, but Lee didn't get a berth despite a promise when Bond sold off the Burnley youth. He had to go to Chester, then via Stoke he ended up in London. He was spotted going into the Cup Final against Stoke wearing a City badge. Hardly the act of someone who hates us. Heard Dixon talking about city teams a good few times over the past few years and never got the impression he hated us. sheblue wrote: Heard Dixon talking about city teams a good few times over the past few years and never got the impression he hated us. Get the impression he has a soft spot for City, not quite a fan. Dixon is a City fan who knew which side his bread was buttered. He loves Arsenal, obviously, and got into the business of punditry by promoting them, as per the Sky direction. When away from them he doesn't have to make such an effort and is allowed to have his say. Dixon is a Blue, coherced into treachery but now sees the light. He is probably the one that will start the trend of pundits that really have an affinity to us. Beefymcfc wrote: Dixon is a City fan who knew which side his bread was buttered. He loves Arsenal, obviously, and got into the business of punditry by promoting them, as per the Sky direction. When away from them he doesn't have to make such an effort and is allowed to have his say. Was a boyhood blue, now an arse fan. His words. Of course but there is the old saying 'Once a Blue .....'. Aye, I get it mate but as mentioned he was originally there as a pundit for the Arse, which got him the gig with Sky etc, but now the relevance has changed, and it's a different station, he's allowed to at least rave about his boyhood team. On another note, I really enjoyed the commentary today on BT and really connected with Drury when he spoke about Raheem having to do 20 times as much as any other player to get the accolade. Savage was also fully supportive of the fact that Raheem tripped and didn't ask for the penalty, Raheem even admitting that he didn't feel any contact. Now, after that commentary, you'll understand my bemusement when I switched to SSN and they had a 20 minute piece on the Rag win away to Juve. I expected there to be a few minutes on each team but the fact it went on so long only got me thinking that we wouldn't even be mentioned but to my surprise we were sort of next up. However, there was no narrative of an impressive win or even s decent mention of some great play/goals, it was all about the controversy of the Sterling penalty. What was portrayed wasn't about the mistake by the ref but more the conjecture of Raheem diving for a penalty. And the bemusement for me was why a channel, who now have rights for international football, ie. England, would drop to such lows as to paint a picture that showed an English player in such light. But, then came the catch, the Derby game at the weekend which Sky are showing. So, the unfathomable truth is that Sky put money before any other commitment. They are not a fan of football that many like to see but a slave to the possible hoards that they can attract through their 24 hour reporting, with the zombies believing every narrative they 'state'. As they have no loyalty, why should we? Catch the Sun today !!!!!! Full of hate for us and Raheem . 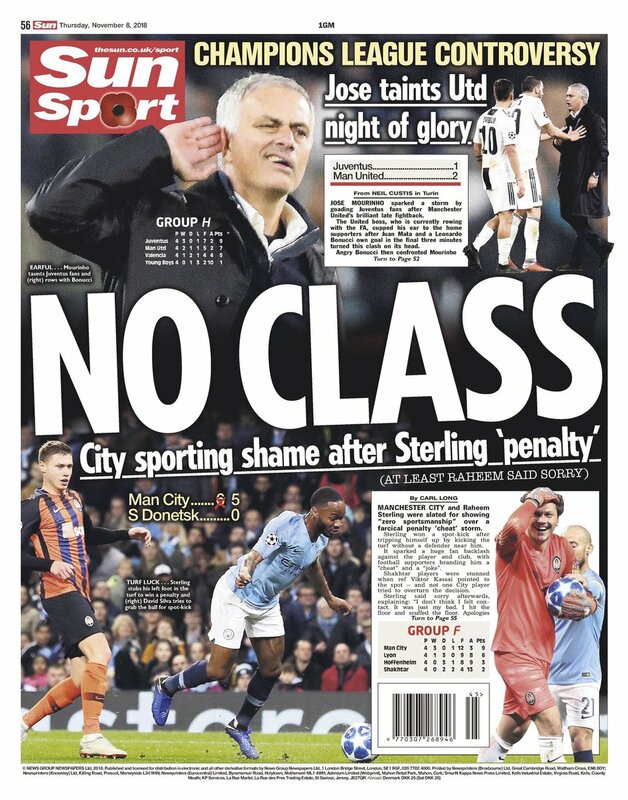 Headline “No class” and they even print the final score at 5-0 !!!!! Disgusting gutter press bordering racist ! City64 wrote: Catch the Sun today !!!!! !